Hi, Here is an image from my video on Newton’s third law of motion. When you are standing can you feel the force from the floor on your feet? Newton’s third law explains that as a result of you applying a force to the floor due to your weight, the floor will apply an equal force to you in the opposite direction. The force the floor applies to your feet is exactly the same size of force you apply to the floor. This is shown in the image below. My feet apply a force to the floor due to my weight and the floor applies an equal but opposite force to my feet. This example demonstrates that forces occur in a pair. They always do. The feet floor interaction produces a pair of forces. The important point to note is that the forces act on different objects. 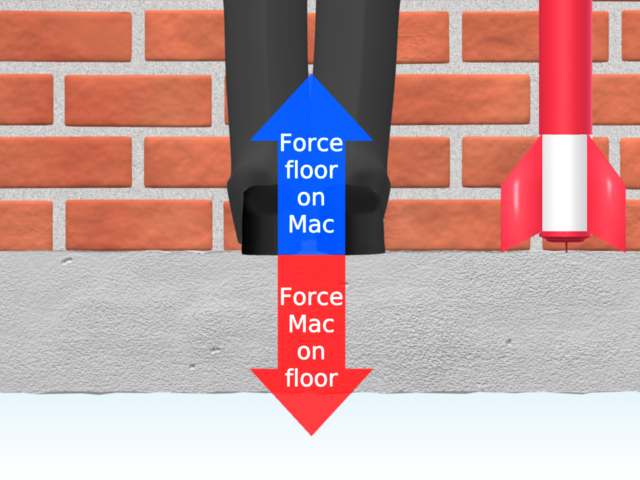 One of the forces acts on the floor and the equal and opposite force acts on my feet. Remember the fact that they occur on different objects as it will help you use the law correctly. I will explain the concept of force pairs in more detail in my ebook on Newton’s third law of motion. Next story How do you like my kart? Thanks for your feedback Ahmed.